HPECO Materials: 100% Silicone coated surface. 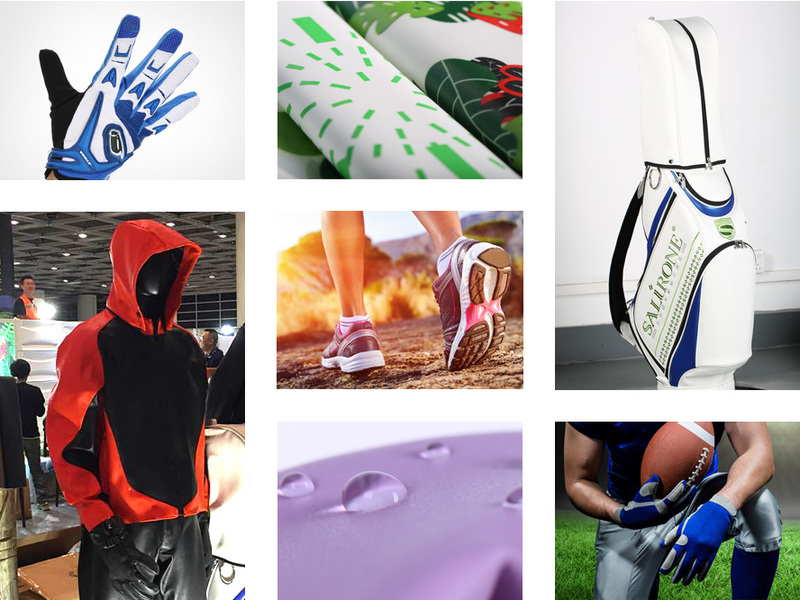 *HPECO materials are being used on various sporting design, including sports gloves, footwear, bags, hats, sportswear and others. *HPECO materials can be directly printed, customized your own patterns, to meet the broader business opportunities. *Professional micro drilling technology, so that HPECO materials both waterproof function, and solve the ventilation problem. HPECO materials are reliable on colorfastness and UV resistance. Customized colors could be made according to Pantone or customer request. The pattern and texture for HPECO materials are made according to the related industrial standard. Please contact Salirone for any other customized pattern design if required. HPECO materials structure is integrated by two silicone layers and substrate materials ( Microfiber, Polyester fibre, etc). Silicone layers thickness from 0.15mm - 0.3mm; Substrate thickness from 0.3mm - 1.2mm. For any other composite material options or thickness required, please contact Salirone for further discussion. Tearing Strength, Seam Strength and Torsion Resistant, etc.